So I just reach over his shoulder like this, put him in a headlock, and then snap his neck like a twig. 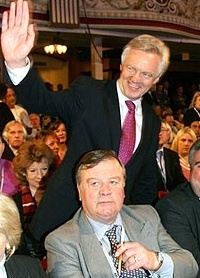 David Davis - proof that David Cameron isn't the only marionette in Conservative politics. Leadership candidates react differently to the ‘No lighting up in the Conference Hall’ sign: Clarke fiddles with a surrogate cigar, whilst Davis plans a dull speech. Bye bye Liam! Bye bye David! Clarke: Gottle of Geer, gottle of geer! James Hellyer - proof that Fox fans aren't funny. That's a bit harsh, Mark. You may not like Mr Hellyer but I have several friends who are supporting the Dr who have a great sense of humour - as do friends who are supporting the other candidates. I like Liam AND David Cameron, and I'm a hoot. Selsdon, I'm sure James will see the funny side of gentle ribbing. Nothing to do with dislike - James can be robustly abrasive, but I admire him. If I were putting together a shadow cabinet, he’d be in it. Davis and Clarkes reation as their wives walk into the room. "Its goodnight from me . . and its good night from him"
Davies: It's ok everyone, I've found Ken. Here's the most up to date tory poll??? Davis "It's alright security, he's with me"